There is a brand new charging location in Franklin TN at the McEwan Building. It went live last week so I ran over there to check it out and see if there is a fee to use the stations or not (there isn’t they are free). The Toyota Tacoma blocking one space was no surprise, however I was sorely disappointed to see a Tesla owner use the space as a parking space close to the buildings front entrance. The Tesla was neither plugged in nor charging. EV etiquette is to move your car after charging is complete. Parking in the space without plugging in denies another owner from getting a charge. Better signage would discourage a courteous driver from parking in the spaces. A driver may not notice the charging station if they are in a hurry. The Tesla had temporary tags, so I assume the owner is new to EV’s and may not have learned EV etiquette yet. I returned after getting lunch at Whole Foods and the space was open so I tested the unit and it worked just fine. The good news is that the stations are free to use (at least for now). The station is so new it doesn’t show up on the ChargePoint map yet. (Another reason to use Plugshare which is updated by the EV community faster than the station owners do). Charging Station is free to use!! It’s good to see more ChargePoint stations come to Tennessee. Blink (owned by Car Charging Group) are slowly going bankrupt as did the networks previous owner ECOtality. ChargePoint have good reliable charging stations, a great website and you can start a charging session without one of their RFID cards if you need to with a smart phone or if you call them. One feature of ChargePoint stations I like is that the plug is locked and won’t release unless you initiate a charge session, this reduces the likelihood of petty vandalism. Update: I’ve been by a few times in the past few weeks and every time the Tesla is in the space not plugged in. The owner is unaware of the EV etiquette or doesn’t care. I have a polite note for when a GAsoline car parks in an EV space. I’ll have to devise one for when an EV blocks an EV space. 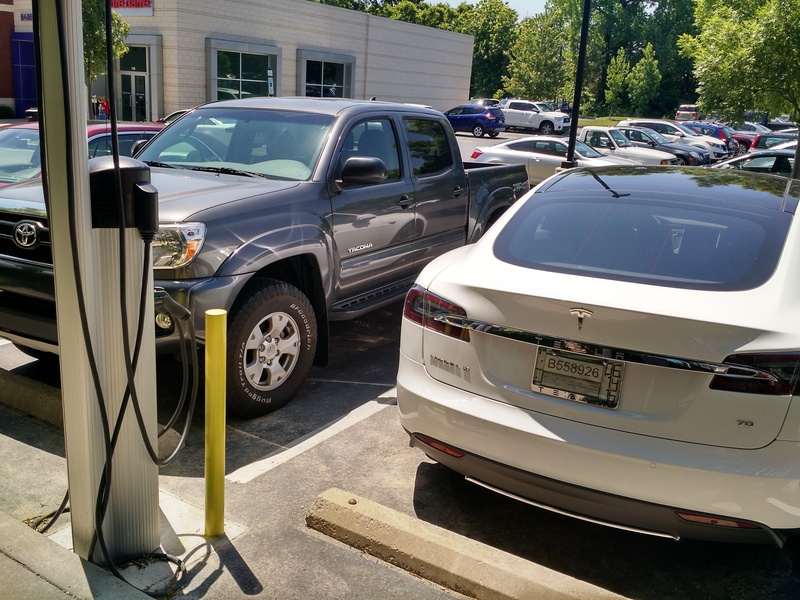 This entry was posted in Blink, Carcharging, ChargePoint, Electric Car, Level 2 EV Charger, Nissan LEAF, Tesla Model S and tagged ICED, Tacoma, Toyota. Bookmark the permalink.